3.1 - Our 'Free Fast Delivery' service is for orders £100 and above, which are under 50KG for most mainland customers with UK addresses that are not located in Grampian, Scottish Highland and Offshore areas. 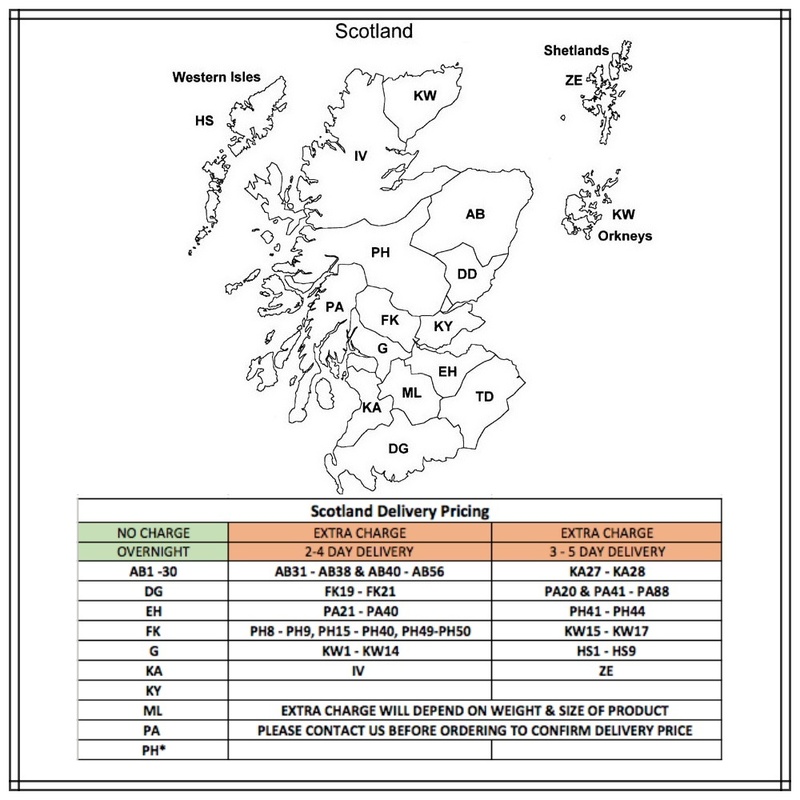 Orders made for delivery to Scottish Highlands or Offshore areas will be required to pay an additional surcharge of up to £75, depending on size & weight of order. All goods must be signed for by an adult aged 18 years or over upon delivery. 3.2 - Delivery charges and estimated timescales are specified in the Delivery Information section. We make every effort to deliver goods within the estimated timescales, however delays are occasionally inevitable due to unforeseen factors. We are under no liability for any delay or failure to deliver the products within the estimated timescales. 3.3 - Risk of loss and damage of products passes to you on the date when the products are delivered or the date that the first delivery is attempted by the courier. 3.4 - Delivery is to the nearest kerbside of your address. Some drivers are happy to take items to your front door or into the property upon request, but this is at their discretion and we cannot guarantee that they will do this. We cannot beheld liable if any damage occurs as a result of items being taken into the property. 3.5 - Delivery with the courier company is a one-man service, we advise that you have someone able to assist the driver with unloading your order, especially on any orders over 40KG. If you are unable or cannot arrange for someone to assist the driver, please contact the courier company directly, on the contact number provided in your Tracking Information Email. 3.6 - Please note we always recommend allowing at least 3 working days between delivery and fitting so that in the unlikely event of a hiccup it can be resolved without inconveniencing you, as we are not liable for any installation costs or lost wages. 3.7 - We advise that all deliveries can take up 2 – 3 working days to arrive, after being collected from us. 3.8 - Some orders placed before 11am Monday – Thursday, may be available for next day delivery. You will be contacted via email if next day delivery is available. 3.9 - Most deliveries take place between 7am and 7pm. For larger items the driver may only be able to deliver to the kerbside. 3.10 - We are only able to send a maximum weight of 50kg per item with our courier service currently, please check products for maximum size available under this weight. If you require a large single cut e.g. 20m x 4m, please contact us before placing your order. 3.11 - If you require a specific date of delivery, please call us to ensure we can deliver on that day. 3.12 - We will email you when your order is ready for collection by our courier, we will also provide you with tracking information and estimated day of delivery for your order. 3.13 - We also provide a contact information for the courier if you require an estimated time of delivery on the day. We are unable to provide an estimated time of delivery on the day with your tracking information email, as we are not given this information by the courier. 3.14 - Any delivery requests such as a call before arrival or an hour before delivery, can be passed onto the courier company but cannot be guaranteed. It is at the discretion of the driver. 3.15 - The courier company do not take goods up any stairs. 3.16 - Please check all items for damage before signing for the delivery. 3.17 - If the item arrives damaged, reject the delivery. Allow the courier to take back your order and return the item to us. 3.18 - We are currently looking at alternative courier services to send our goods - We will update our customers when we are able to send carpets over 50kg. 5.1 - When ordering from Carpet Shop Online via the website or over the phone you have a right to cancel and return your order up to 14 days after receiving your order. Some products are excluded from this policy for example items which are cut to your bespoke size. Please note you will be responsible for the organisation and cost of returning the item(s) to us. All items must be returned in the same packaging and condition in which they were received by you. 5.2 - In the unlikely event that you receive faulty or damaged goods, please contact us prior to cutting and/or fitting the item(s) as soon as possible and we will arrange for the faulty or damaged goods to be collected and replaced. Unfortunately if any ordered item is removed from it's original condition (for example cut and fitted) we will be unable to replace the item(s). 5.3 - Sometimes the product specifications fromthe manufacturer may change, in which case we will do our best to offer you asimilar alternative. We may experience problems with the supply of certain products and may therefore supply a substitute of the same or better quality at the same price. We will contact you and discuss this with you before making any decision. 5.4 - In the unlikely event that we have sent the wrong product or size then we will arrange for a replacement of the item(s) at our expense. 5.5 - If you are not happy with the flooring, we are happy for the flooring to be returned. However, you the buyer will be liable for cost & organising the item to be returned. Ensure goods are fully packaged as received (undamaged). 5.6 - All flooring must be inspected prior to installation. We will not accept any liability after the flooring has been installed. 5.7 - If you would to like make a complaint regarding an order or item(s), please see Section 10 – Complaints Resolution Procedure.